It looks like that though we travel to more and more places we were dreaming about, it doesn’t make that dream list shorter but longer. As we see more of the world, our dreams grow bigger. One of these big dreams was visiting the Whitsundays. All we knew about it was that it looks unrealistically beautiful in pictures and it’s far. Very far. Then we bought our air tickets to Melbourne. Travelling to Australia was also a dream. If such a dream can come true, why not try another one? The Whitsunday Islands is a collection of 74 islands in the heart of the Great Barrier Reef. Most of them are uninhabited and belong to the Whitsunday Islands National Park. Undeveloped, unspoilt wonders in the Pacific Ocean waiting to be explored. 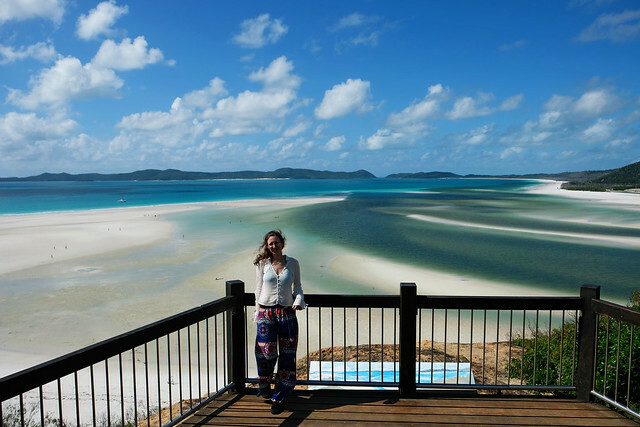 The largest one in the group is Whitsunday Island that is home of Whitehaven Beach, the one we knew from those perfect photographs. Whitsunday Island is not an easy place to get to. There’s no ferry to take you there. It’s an uninhabited island after all. Your only option (unless you have your own boat, in which case we honestly wish to make friends with you 😛 ) is to sign up for an organized excursion. 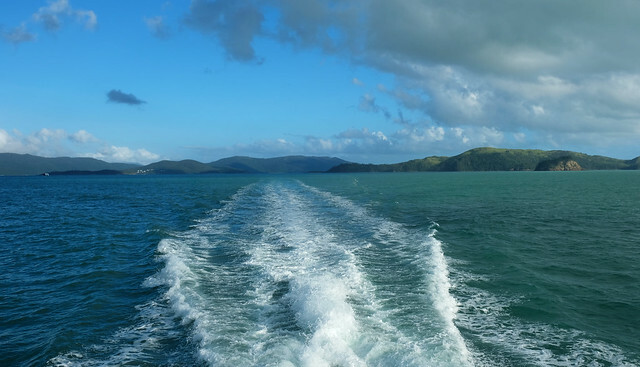 Cruises of different length depart from Airlie Beach and Shute Harbour, offering a variety of activities around the Whitsundays. 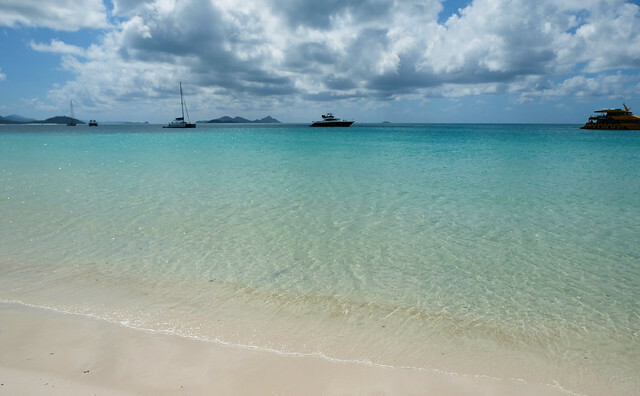 But we were looking for one that will allow us a good amount of time on Whitehaven Beach. Stopping there, taking some pictures and having a quick swim was not enough for us. If we fulfill a dream, let’s do it properly. 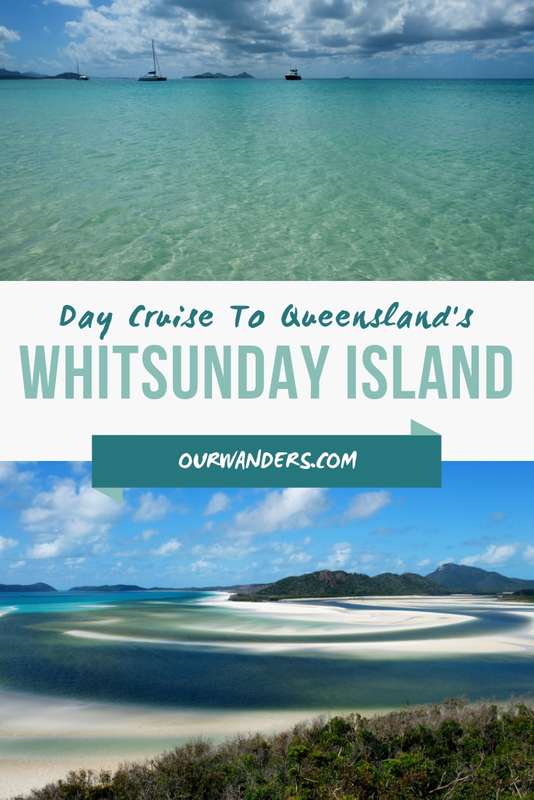 That’s how we ended up choosing the full day cruise to Whitsunday Island led by CruiseWhitsundays. On that particular day we were eagerly waiting for our vessel to depart from Port of Airlie at 7 in the morning. The ride to Whitsunday Island took about 1.5 hours, and it was an enjoyable activity itself. I was definitely very active, jumping up to take pictures of the surrounding islands in like every 2 minutes. Others who are not that restless as me could enjoy the views from the air-conditioned cabin or from the open, shaded deck. When we arrived, we had it all to ourselves. It was a calm, sunny day. Water temperature was 26°C (gosh, that is really a dream!). We spent most of our day swimming, or just walking in the fine white sand along the beach. 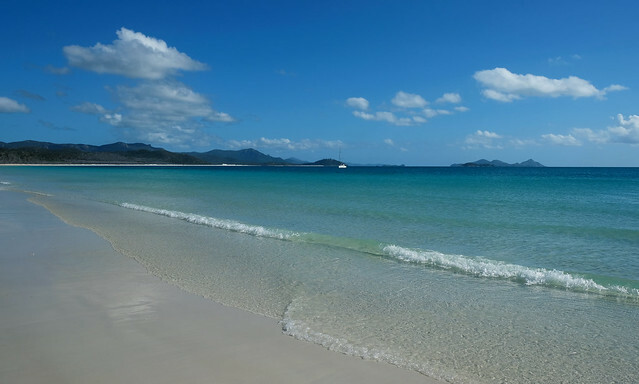 Whitehaven Beach stretches to 7 kilometres, so there’s space for romantic walks for everyone there. Later in the day, some more boats arrived that made Whitehaven Beach a bit more crowded by Aussie standard (aka if you’re not alone on a beach, it’s crowded). 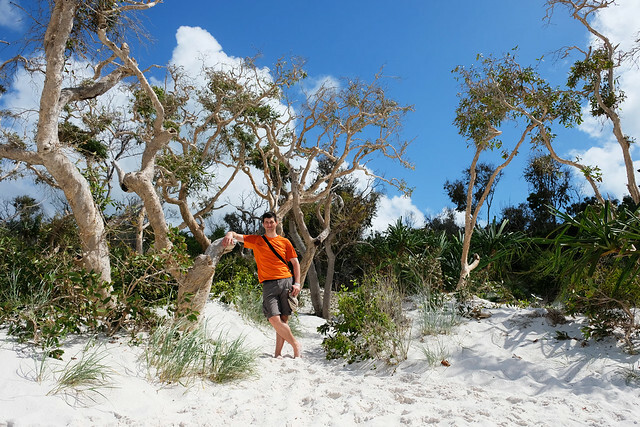 CruiseWhitsundays offered some guided hikes on Whitsunday Island during the day. As passionate hikers we were sure we want to do all. That, until we haven’t arrived to Whitehaven Beach. Once we did, we felt we never ever want to leave that beach. But there was one hike our guide greatly recommended to do, and she promised it will be just as spectacular as Whitehaven Beach. So we hopped into a smaller boat this time and headed to Hill Inlet. The walk to Hill Inlet Lookout is nice and easy, you can even do it in flip-flops (yes, it’s definitely just a pleasant walk and not a hike, since we are serious about proper hiking boots otherwise). But the view we got at the lookout can easily compete with any of the wonderful panoramas we enjoyed during our hikes. We couldn’t get bored with the countless shades of blue and green, and their shades were changing as clouds were moving through the sky. 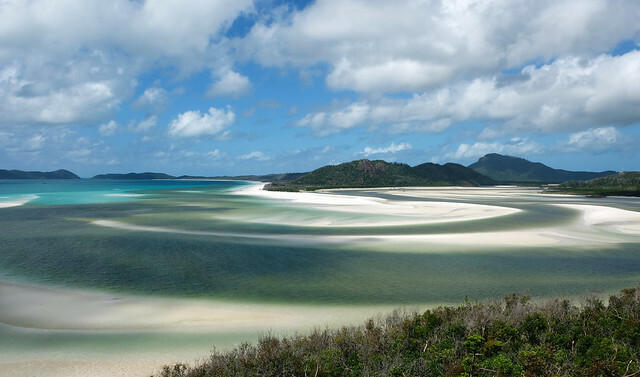 We realized that this was the picture that made us want to visit Whitsunday Island in the first place. On our way to the lookout we bumped into hundreds of small, blue crabs. 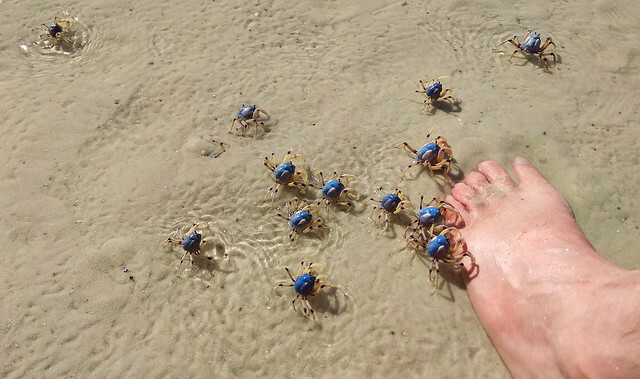 We usually get excited about any kind of wildlife, but we’ve never thought we’d call crabs cute. Now these ones were. One could hold them in their hand and they won’t hurt. Not to mention they represent another shade of blue in this paradise. 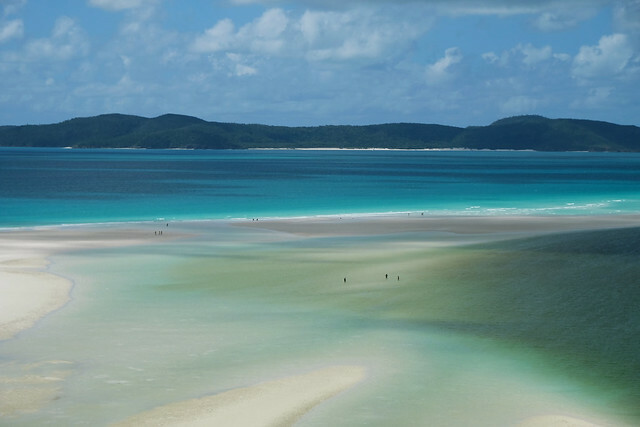 As much as we love hiking, all we wanted to do after our Hill Inlet walk was enjoying the beauty of Whitehaven Beach. Luckily, we could do it all day long – well, until about 4 pm when our vessel departed. Our friendly crew provided us with everything that can make our day more pleasant: beach tents, beach game items, cold drinks and a delicious lunch. 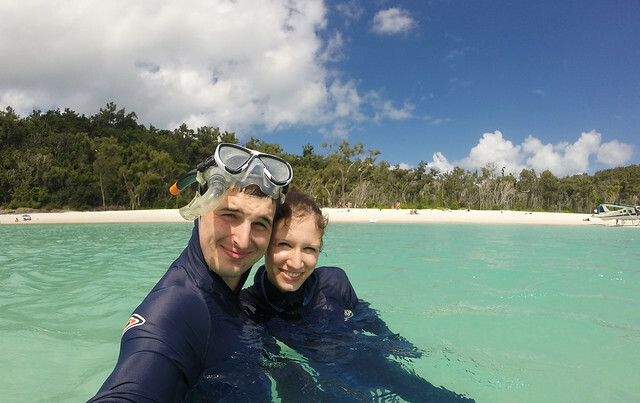 Csaba also did some snorkeling by the cliffs at the end of Whitehaven Beach and he caught a glimpse of a ray. Otherwise the water is so clear that we could see fish without even putting our head into the water. However, there’s no reef close by and it’s not a spectacular snorkelling site. Whether you know it or not, the warm waters of tropical North Queensland are home to some of the most dangerous marine stingers on Earth. They can be present in the water especially from November to May – the so-called “stinger season”. 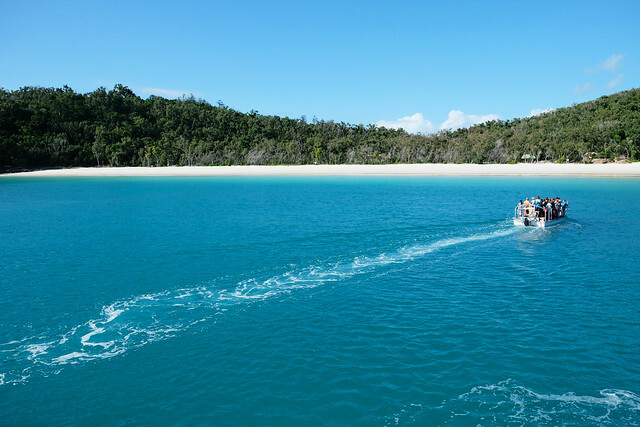 Excursions to Whitehaven Beach are organized all year round, and tour companies can usually provide you with “stinger suits”, if you visit during stinger season. These are full-body lycra suits that provide a good measure of protection against marine stingers. We visited Whitsunday Island at the end of April. CruiseWhitsundays provided everyone with a stinger suit of their size free of charge and asked us to wear it when in the water. It was a bit strange at first to dress up so much for a swim. But our opinion is that it doesn’t worth the risk not using them. In addition, stinger suits are a very effective way to protect our skin against intense sunlight and UV rays. Our skins are so sensitive anyway that we usually cover up when in the tropics. We quickly learned to appreciate our stinger suits that enabled us to swim and snorkel any time of the day without getting sunburnt. What kind of an overall summary could we give after such a long article full of superlatives? 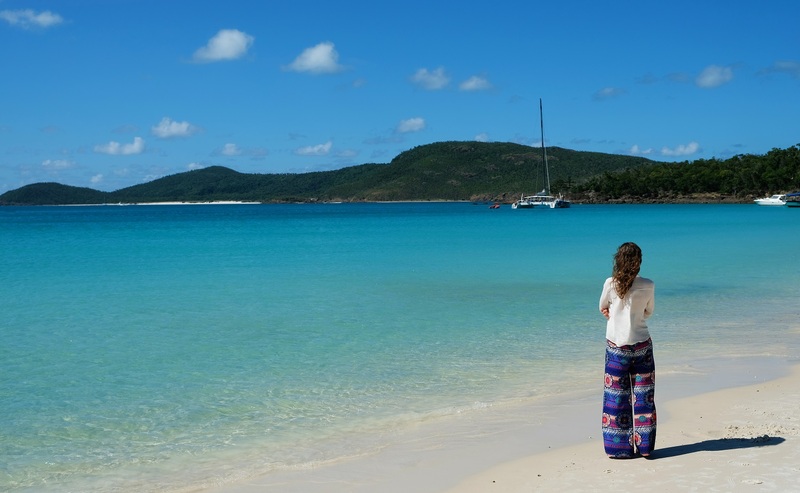 Our only excuse is that the pristine and untouched beauty of Whitsunday Island would enchant anyone. The only bad thing about this trip was that it ended. We were back at Port of Airlie by sunset, ready to continue our way northwards. But all those amazing moments of the day are safe in our hearts. Do you have a dream island? Many thanks to CruiseWhitsundays for the 50% discount on this stunning trip. Like always, we’re keeping it real and all opinions are our own.